Hamaam (Arabic: حمام‎; Hebrew: חַמָּם), or Wadi Hamam, is an Arab village near the Sea of Galilee and Mount Arbel in northern Israel. It is the easternmost part of the al-Batuf Regional Council. It contains one fairly modern mosque and the trail head for the steep ascent of Mount Arbel. In 2017 its population was 1,455. Khirbet Wadi Hamam is an archaeological site practically on the outskirts of Hamaam. The site was excavated between 2007-2012 by a team under dig director Uzi Leibner of Hebrew University and yielded the remains of a large Roman Period Jewish village. 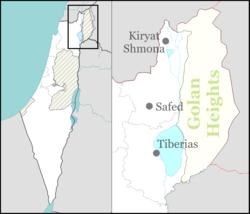 The village was situated at the foot of Mount Nitai and thus on the ancient road connecting the central Galilee, through Wadi Hamam, with the Sea of Galilee. The most important find is a synagogue with a very interesting and relatively well-preserved mosaic floor. The fortifications atop Mount Nitai, which is a nature reserve and off limits for visitors, have also been surveyed and partially excavated with the purpose of dating them and placing them in a historical context. Wikimedia Commons has media related to Hamaam. ^ "Archaeological Excavations at Khirbet Wadi Hamam – A Roman Period Village in the Eastern Lower Galilee, Israel: Summer 2011" (PDF). Hebrew University. 2011. Retrieved 16 January 2015. This geography of Israel article is a stub. You can help Wikipedia by expanding it. This page was last edited on 24 August 2017, at 13:13 (UTC).